MEF backgrounders highlight select news-relevant research and analysis from Middle East Forum staff, fellows, and publications. Join the MEF mailing list to stay abreast of our work. 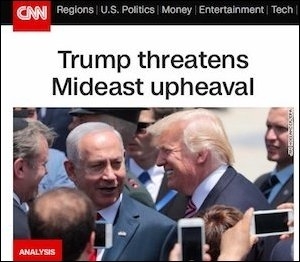 A typical mainstream media headline following Trump's announcement. President Trump announced yesterday that the U.S. government recognizes Jerusalem as the capital of Israel and will begin preparations for establishing the American embassy there. The decision was swiftly and roundly condemned throughout the world as injurious to prospects for Israeli-Palestinian peace and detrimental to American interests. However, research by Middle East Forum staff and fellows over the years shows that this two-pronged conventional wisdom is deeply flawed. The 1947 UN partition resolution designated Jerusalem as an international city, a status that satisfied neither Jews nor Arabs. In the fighting that erupted following the invasion of Arab armies the next year, newly independent Israel occupied the western half of the city and established its capital there, while Jordan's Arab Legion took ownership of the eastern half, including the Old City and Temple Mount. Israeli forces captured and annexed East Jerusalem in the 1967 Six-Day War. U.S.-brokered Israeli-Palestinian peace talks over the last 29 years have focused on the fate of East Jerusalem and other territories captured in that war. Current and past proposals to move the embassy have all involved relocation to West Jerusalem – territory to which Palestinian negotiators have not laid claim. 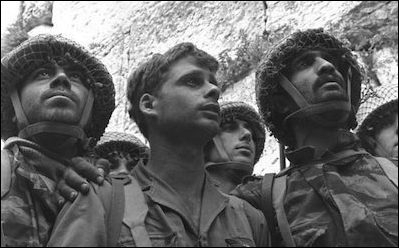 Israeli paratroopers at the Western Wall shortly after capturing East Jerusalem, 1967. Thus, the intense anger expressed by Palestinian and Arab leaders toward the proposed relocation isn't rooted in concerns that Palestinian claims to disputed territory will be compromised. Indeed, it doesn't appear to be rooted in any concerns of ordinary Palestinians. According to a recent poll, just 12% of Palestinians in the West Bank and 25% in Gaza consider the location of the U.S. embassy a "very important" issue. As Marshall J. Breger, a professor of law at the Catholic University of America, explained in a 1994 Middle East Quarterly article, Muslim religious and cultural attachments to Jerusalem are not very deep. Contrary to mainstream media depictions of the city as the "third holiest" in Islam, Jerusalem is not mentioned by name in the Qur'an, was never visited by the Prophet Muhammad, and was never the capital of any Arab-Islamic polity. Delving further in a seminal 2001 Middle East Quarterly article, Middle East Forum President Daniel Pipes finds vast ebbs and flows in expressed Muslim views of Jerusalem's sacredness over the centuries, peaking when the city is occupied or threatened by non-Muslims. While there were few hadiths (accounts of the Prophet Muhammad's words and action) referencing Jerusalem prior to the Crusades, a rich flurry of them appeared when Muslim rulers needed a means of inspiring their subjects to wage jihad against the "Franks." The Dome of the Rock in disrepair, 1875. Once safely in Muslim hands, however, interest in Jerusalem dissipated so rapidly that Saladdin's grandson traded the city back to Europeans just 40 years later in exchange for military aid against a rival. Interest rose again until Jerusalem was regained in the thirteenth century, then declined for six-and-a-half centuries. It rose again during the British mandate period, when Hajj Amin al-Husseini, the infamous grand mufti of Jerusalem, needed a mechanism for inciting his followers to violence. Interest then declined (Al-Aqsa Mosque fell into disrepair, no Arab leader even bothered to visit East Jerusalem for nearly two decades) when the Jordanians ruled the Old City. Its falling into Israeli hands set in motion a new wave of Jerusalem-mania cultivated and instrumentalized by rejectionist Palestinian leaders and others (notably Turkish President Recep Tayyip Erdoğan, as MEF writing fellow Burak Bekdil has discussed here and here). "The Muslim interest lies not so much in controlling Jerusalem as it does in denying control over the city to anyone else," Pipes concludes. "Islam carries the expectation that a land once under Muslim control (Dar al-Islam) is an endowment (waqf) that must inevitably revert to Muslim rule," Pipes writes in a more recent treatment. In this respect, the distinction between western and eastern Jerusalem – and, more generally, between territories held by Israel in 1949 and new ones captured in 1967 – is immaterial. This is why even "moderate" Palestinian leaders balk at officially recognizing the right to exist of a Jewish state, whatever its borders. At most, they are prepared to accept that a state by the name of Israel exists and extend generic diplomatic recognition to it, and only provided that the "right of return" to Israel for millions of Palestinians – which would mean the evisceration of Israel's Jewish majority if exercised – not be formally disavowed in a final status settlement, which is unacceptable to most Israelis. For seven decades, the U.S. and other governments declined to recognize any part of Jerusalem as part of Israel, let alone its capital, instead locating their embassies over 40 miles away, in Tel Aviv. Initially reflecting hopes of resurrecting the 1947 internationalization proposal, it is now a convention entirely driven by fear that recognizing Israeli sovereignty anywhere in Jerusalem will alienate Palestinians and the broader Arab-Islamic world, damaging prospects for peace. But the refusal of successive American presidents to fully recognize Israeli sovereignty even over territory within the 1949 armistice lines has undermined the peace process by encouraging unrealistic hopes among Palestinians that rejectionism will pay off. "The main impediment to Palestinian compromise is not Palestinian suspicion," explains MEF Director Gregg Roman, "it is the fundamental unwillingness of Palestinian leaders across the spectrum to accept the existence of a Jewish state alongside their own." With the peace process at an impasse of their own making, Palestinian leaders have in recent years launched an aggressive campaign to delegitimize Israel in international fora, culminating in a burgeoning Boycott, Divestment, and Sanctions (BDS) movement in the West, a UNESCO resolution last year minimizing Jewish connections to the Temple Mount, and a UN Security Council resolution (2334) months later that effectively declared Israeli claims in disputed East Jerusalem null and void. Instead of pursuing a peaceful path to statehood, they have incited violence against Israel, while trying to persuade the rest of the world to recognize Palestinian statehood in the absence of peace. Jerusalem is a central component of Palestinian Authority President Mahmoud Abbas's incitement of anti-Israel violence. The success of these endeavors partly reflects the growing dependence of European left-wing political parties on Muslim immigrant votes, according to MEF Shillman-Ginsburg Writing Fellow Michel Gurfinkiel. However, MEF Shillman-Ginsburg Writing Fellow Efraim Inbar argues that many in the West "simply do not want the Jews to have full control over the eternal city." Indian Prime Minister Narendra Modi, who made an unprecedented visit to Jerusalem last July, and Russian President Vladimir Putin, whose foreign ministry officially recognized Israeli sovereignty over West Jerusalem in April, apparently felt no such taboo. The Obama administration's turn against Israel gave an enormous boost to the delegitimation campaign. "Years of hostile U.S. actions under the Obama administration, from the Iran nuclear deal to UNSCR 2334, have emboldened Israel's enemies to believe that they can win the public relations war against the Jewish state," wrote Roman shortly after Trump's inauguration. "Together with Israel, the Trump administration must now convince them that they have lost." Whether the Trump administration's decision to recognize Jerusalem as Israel's capital will achieve that remains to be seen, but it's a start.